All purpose cleaner suitable for all hard surfaces and water-resistant surfaces; i.e glass, mirrors, plastic, enamel, porcelain, stainless steel, natural stone, ceramic tiles, painted wood. 100% natural and organic without additives or dyes and contains no harmful substances or chemicals. Benefits the environment when emptying cleaning water into sewers and drains, reducing the risk of clogged pipes and reducing nasty odour. • Can also be used in high-pressure cleaners and polishers. • No more multiple product cleaning. • Good results every time with reduced water requirement. 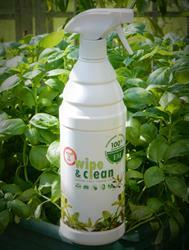 Be the first to submit a review for the Wipe & Clean Kitchen Cleaner (Mint).